Phinda Private Reserve is the ideal location for a romantic honeymoon or a well-deserved luxury break away in an idyllic African setting. By Air: The easiest and fastest way to access Phinda Private Game Reserve is by air. Private chartered planes can be arranged from Richard's Bay airport. Guests would need to fly in to Richard's Bay from Durban International Airport or Johannesburg's O. R. Tambo International Airport.By Road: Phinda is a 7 hour drive, approximately 600 kilometres (370 miles), from Johannesburg and 3.5 hours or 350 kilometres (220 miles) from Durban on well-maintained tarred roads. King Shaka International Airport in Durban or Richard's Bay airport. Daily morning and afternoon or evening guided safari game drives unravel the mysteries of the African bush while you sit back and enjoy the sense of adventure, as your guide weaves and wanders through the vegetation. Phinda is home to the Big Five, as well as Cheetah and many other wildlife species. The trained guides will endeavour to provide you with unique and memorable viewings of a diverse range of mammals and birds. The lodges' rates all include meals which are carefully prepared, alluringly displayed and mouth-wateringly delicious. A guided game walk offers the unique opportunity of enjoying a safari game-viewing on foot. Guests can enjoy a number of different activities while staying at one of the luxury lodges within the game reserve. Cool down with a swim in the pool after a successful and informative morning guided game drive or spend some time reading a book while relaxing on the viewing deck or in the comfort of your deluxe well-appointed suite. Guests can also enjoy guided nature walks and excellent bird watching. 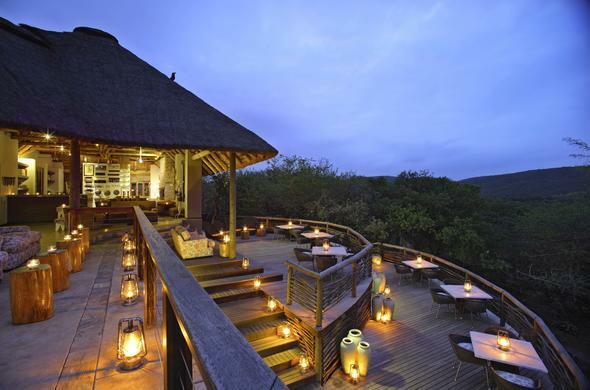 Phinda offers 6 unique, beautifully appointed luxury safari lodges to choose from. Each of the lodges has its own distinct feel and offers a diverse experience. Phinda Private Game Reserve offers decadent luxury, Big Five game viewing and five-star service in a pristine and enchanting slice of African splendour. Phinda Private Game Reserve is not open to day visitors and only guests staying at one of the 6 luxury lodges can enter the game reserve.Early morning and early evening guided game drives whisk one away into the bush in search of breath-taking game viewing experiences, as enthusiastic guides endeavour to share their love for all that an African safari holds, with you.The wildlife reserve's landscape varies from hilly or mountainous areas in the west to flat savannah plains and sand forest and each twist and turn in the road reveals new delights and enticements.After the game drives you are returned to the comfort of the lodge and the serenity of your suite where you can relax in comfort and style before enjoying a delicious meal gazing out into the distance or up into the clear night sky. Phinda adjoins uMkhuze Game Reserve and thus shares a very similar climate with rainfall taking place between November to February in the summer months. Temperatures can range from 22°C to 33°C (71.6 - 91.4°F), dropping to 10°C - 12 °C (50 - 53.6 °F) in July during the winter. The best game viewing occurs between March and September however one will enjoy visiting at any time of the year. Phinda is located in a low-risk Malaria area and guests are advised to take precautions prior to their visit. Children are welcome at the lodges and child carers can be arranged at additional costs. As there are not fences around the accommodation areas in the evenings guests are advised to always inform a guard when wanting to move from their room to the communal areas and back.